The phone call came through late on Monday afternoon this week. Kids Helpline has now responded to its 8 millionth request for help from a young person in Australia. This marks a significant milestone for the country's only free, 24/7 phone and online counselling service for young people. "Since the launch of the service in 1991 a young person has attempted to contact Kids Helpline every 56 seconds and on average we manage to deal with around 800 calls or online requests for help every day," said yourtown CEO Tracy Adams. "We want to take a moment to recognise our dedicated counsellors and the teams behind the call centre, as well as the community, who fund more than three-quarters of our service by buying tickets in the yourtown Art Union Prize Draws," Tracy said. "While the 8 million figure is an important milestone for us, we know our work isn't done. While we do our very best with the resources we have, more than 186,000 calls and requests for help have already gone unanswered this year alone." For 21 year old Molly, the Kids Helpline service has been vital for her very survival, having called the counsellors numerous times when suffering serious mental health issues. "There are times I know I wouldn't have made it through to the next morning if I hadn't been able to call Kids Helpline. The counsellors have helped me calm down and are able to get me thinking reasonably again. There's no way I would be here today if it wasn't for the service," explains Molly. Molly's mother Sue agrees: "I will always be eternally grateful to Kids Helpline. Without them I doubt we would still have our beautiful daughter." Kids Helpline opened on 25 March 1991 with more than 3,200 young people making a call on the first day and Kids Helpline has responded to more than 8 million contacts over 27 years. In 20l7, Kids Helpline responded to 157,656 contacts from children and young people nationally. We also had 607,634 unique visitors to the Kids Helpline website with 2,051,60l page views. Since 2001, Kids Helpline has initiated 18,382 Duty of Care emergency care actions to keep children and young people safe. The average counselling session time via phone in 20l7 was 32 minutes and 54 minutes via WebChat. An increase in the complexity of issues and the need for more intensive, longer sessions has seen a 72% increase in the counselling time over the last ten years. You can support Kids Helpline by buying a yourtown Prize Home ticket. Kids Helpline is here anytime and for any reason. 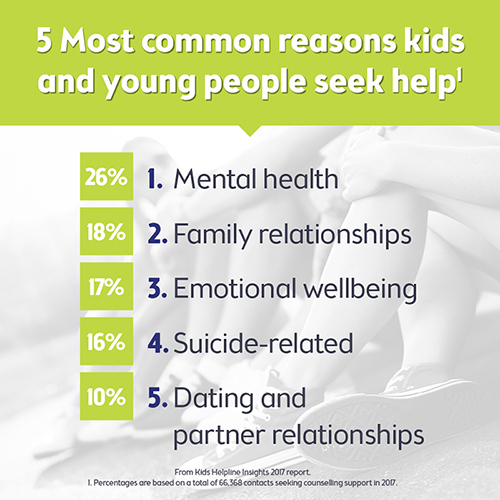 Visit kidshelpline.com.au or free call 1800 55 1800.